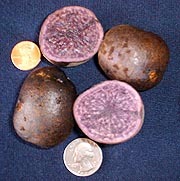 The All Blue potato is a deep-blue skinned, with consistently blue flesh, almost purple. Smooth skinned, shallow eyes and excellent flavor. Makes very interesting french fries and mashed potatoes, and a must for the all-American red, white and blue (and yellow too) potato salad.